The other day, I realize I was running low on shampoo. That, of course, meant that I needed to pick up some more at the store some time. Before I was completely out. Used to be that you'd simply pick up shampoo. There was a brand, and that brand had one shampoo. Maybe two. But today, each brand has more types of shampoo than you can manage. Or more than I can manage. Some time back, I received a Dove Care Men Plus or something named sorta like that, as a gift. It had soap, body wash, and shampoo. And, I liked it. So, when I needed more soap, body wash, or shampoo, I'd get the Dove Plus Care Men stuff. So, as I said, I needed shampoo. So, I saw the Dove Plus Men Care stuff on a shelf in the store. Only, I wasn't sure which one. The one with one shade of sorta green. The one with a different shade of sorta green. Or maybe this other shade of sorta green. Anyway, I grabbed one that was maybe the same as the one I had been using and liked. Wrong one. Of course, I didn't find this out until days later when my shampoo ran out and I opened the new bottle and used it. I knew right away it was different. My head felt odd. I stopped, rinsed my face off so I could see without getting shampoo in my eyes, and looked to see what that was I had put on my head. Sure enough, it was shampoo. But, then I read the label and didn't look at the pretty colors. And the label said, "With Caffeine And Menthol." Great. I'm now putting the equivalent of Maxwell House and a pack of Kools on my head. Now I have to decide if I want to finish off the bottle of shampoo, or go back to the store and try to find the right stuff. I do have the original flavor body wash and soap, so I could actually write down what it is I want. Or take a picture. And, I will do that when I pick up another bottle of shampoo. Only, by then, will my head be addicted to the caffeine and menthol? Will I be up to three shampoos a day? I may have to go on the patch. 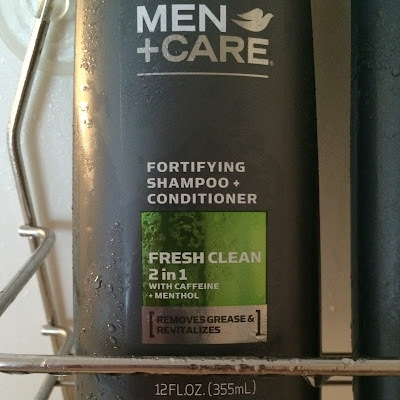 i thought i was the only one bamboozled by the plethora of shampoo/conditioners/bodywash permutations, but i haven't noticed the caffeine and/or menthol. Well, if your neighbors see you standing outside with hair covered in shampoo, a cup of coffee in one hand and a Kool in the other, you might have a problem. Huh. I thought ThinkGeek was the only place to buy caffeinated body care products. Yup, nothing like snorting up a shot of shampoo in the morning to REALLY WAKE YOU UP!!!!! Publix. Or maybe it was Walmart. One of them. Do you have kids? Don't be surprised if you get a visit from CPS because of your exposing them to second-hand shampoo fumes. Didn't think about that with the kids. Youngest is 27, so Ga DFCS may not stop by. But these days, you never know. Ah, the jug a day routine...wrapping the empties in newspaper so the garbage man doesn't judge you. Hey, aren't children still on their parents' insurance until age 28 or 35 or 40 or something? The local DCFS might see that as still being under parental control. So keep that jolted up nicotine hair away from the young 'uns, OK? Unless you're gonna provide them with some nicotine withdrawal patches through OblahblahCare. I hate when they discontinue the one you like. I love this body wash called Vanilla Indulgence. Mmmmm. But as soon as my stockpile is gone, I'll probably be doomed to some icky variety like Green Tea. I don't care HOW healthy it's supposed to make your hair if it smells like wet cardboard. Gee, they put the darndest things into shampoo..
@12 - Wait... are you asking me to find you some more Vanilla Indulgence, or are you asking me to shampoo your hair? Ooh but you could find me some shampoo that smells like cookies. ..
@12 Wrong place to ask, Anon. IMAO seems to be mostly populated with people firmly committed to never doing things. Which is why we'd make awesome politicians. Might as well face it, you're addicted to suds.